In 2012, the Peterson Foundation launched the Fiscal Confidence Index to help policymakers, members of the media, and the American public gauge public opinion on the nation’s fiscal and economic challenges. The Fiscal Confidence Index is an important indicator of the American public’s views about our fiscal and economic condition and the progress elected leaders are making in addressing it. Since its inception, the Fiscal Confidence Index has consistently shown that Americans hold deep concerns about the level of our long-term debt, and they urge policymakers to make addressing our fiscal and economic future a top priority. The individual scores in these three areas are averaged to produce the Fiscal Confidence Index value. 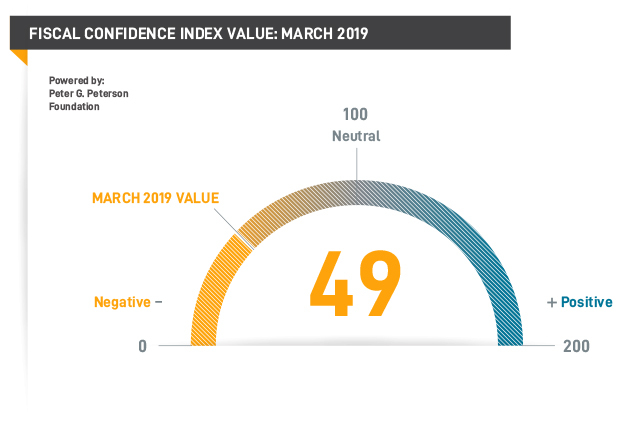 For March 2019, the Fiscal Confidence Index value is 49 (100 is neutral). Topline survey results from the Fiscal Confidence Index for March 2019. The FCI value for March is 49. The Peter G. Peterson Foundation commissioned this poll by the Global Strategy Group and North Star Opinion Research to survey public opinion on the national debt. The nationwide poll included 1,000 U.S. registered voters, surveyed by telephone between March 18, 2019 and March 21, 2019. The poll has a margin of error of +/- 3.1%. The poll examined voters’ opinions on the national debt, political leadership, and America’s fiscal and economic health. The six questions, by category, used in surveying for the Peter G. Peterson Foundation Fiscal Confidence Index. For full methodology, click here. Thinking about our national debt over the last few years, would you say your level of concern has increased or decreased? Is that a lot or just a little? NEW YORK — Strong bipartisan majorities of voters continue to hold serious concerns about the nation’s fiscal outlook, according to the Peter G. Peterson Foundation’s Fiscal Confidence Index, a monthly measure of public attitudes about the national debt and the efforts elected leaders are making to address America’s fiscal challenges. The March Fiscal Confidence Index, modeled after the Consumer Confidence Index, is 49 (100 is neutral), indicating that voters remain troubled by the lack of action in Washington fix America’s longstanding and worsening debt problem. For media inquiries please call (212) 542-9200 or jrosen@pgpf.org.